The entrance to Ft. Lowell Park is located at 2900 North Craycroft Road in Tucson. Along with the usual offerings, this city park is home to a museum and artifacts dating from the time in the late 1800s when Fort Lowell was an active military post. The fort once played a major role in the Apache wars. In the 1860s, Tucson’s population was around 700. The dusty little community centered on what are now Main, Washington, Church and Pennington Streets. Water flowed in the Santa Cruz River, the irrigated fields along its banks producing a variety of crops. During the summer of 1866, the army established Camp Lowell on a site slightly to the east of town in what is now the downtown area. The installation was named in honor of Col. Charles Russell Lowell, Jr., a Union officer killed in battle in the Shenandoah Valley during the Civil War. By 1872, Tucson had expanded to the camp’s edge. The camp’s water supply was suffering from contamination problems, the troops often coming down with malaria. Along with the water troubles, the camp’s close proximity to the rowdy saloons in Tucson fostered a host of other issues. The army decided it was time for a change. In March 1873, Camp Lowell was moved about seven miles to a new location on what is now Craycroft Road. As time passed, Camp Lowell acquired additional regional military functions, its name was changed to Fort Lowell in 1879. One of 12 large military posts in Arizona, Ft. Lowell was responsible for the area south of the Gila River to the Mexican border and east to the San Pedro River. For the better part of it service life, the fort was home to an average of 150 officers and enlisted men. At the height of the campaigns against Geronimo’s Apaches in the 1880s, the fort was garrisoned by 18 officers and 239 enlisted soldiers. It was a sprawling, unfortified installation containing a parade ground, officers’ quarters, enlisted barracks, kitchens, warehouses, stables and a hospital. 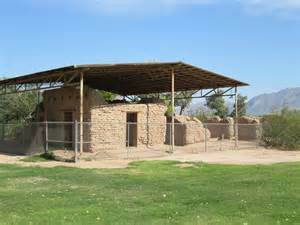 The fort’s large buildings were constructed of Adobe bricks made from a mixture of sand, silt, clay, horse manure, straw, and water. Before being used in construction work, the shaped bricks were baked in the hot sun. The walls of the fort’s buildings were 20 inches thick, the ceilings 10 feet high. 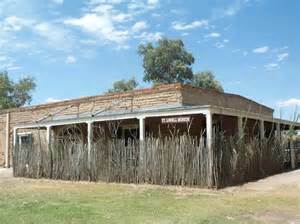 The post hospital was a 60 foot by 120 foot structure containing 13 rooms and 16 beds. Dr. Water Reed, the post surgeon in 1876-77, became one of the most noteworthy officers to have served at Ft. Lowell. Dr. Reed would go on to make medical history in the late 1890s when he discovered how Yellow Fever was transmitted by mosquitoes. His discovery led to new methods of controlling the disease that were used throughout the world. At the fort, there were rules for keeping soldiers clean. Bathing and the changing of underwear were a requirement on Saturday. To ensure compliance, the process was overseen by the NCOs. There were few jobs available for women at that time. Laundresses were the only women with official status, many of them being wives. They were paid $1 to $1.50 per month by every soldier for washing clothes. The laundresses were phased out in 1883, ending an 80 year relationship with the army. The quartermaster corrals at Ft. Lowell were an important link the army supply chain because the terrain was rough, roads were few. The army used sure-footed mules to haul supplies in pack trains. Each mule could carry about 200 pounds. On the roads, a freight wagon pulled by six mules could carry a load of 3,000 to 3,500 pounds. In 1880, the railroad reached Tucson, making the logistical situation a lot easier to manage. Tucson’s population at the time was slightly over 7,000. It was the largest city between Los Angeles (11,183) and San Antonio (20,550). 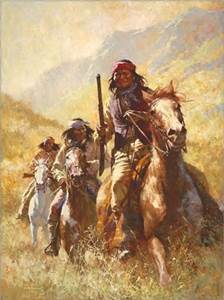 The Apache campaigns were waged over difficult, rugged terrain against an indomitable foe. The soldiers dreaded assignment to Arizona because they mostly lived in crude conditions in the field. A song or poem called “Back to Arizona Again” was very popular with the troops. It lamented the heat, cactus, dirt, rattlesnakes and other difficulties associated with desert service. 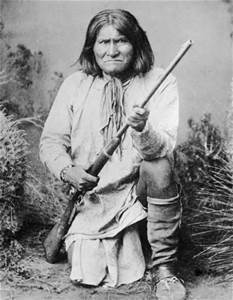 As commanders confronted the arduous task of subduing the Western and Chiricahua Apaches, they found they had to rely on the abilities of skilled Apache scouts. The scouts served in companies commanded by regular officers and Apache NCOs. They were paid the same rate as soldiers and enlisted for periods up to 12 months. Detachments as small as 18 soldiers would go out on patrol for 30 days, covering 500 miles. Their rations consisted of hardtack, bacon, beans and coffee. They could be resupplied at forts along the patrol route. Between 1866 and 1886, the army fought over 240 engagements in Arizona. 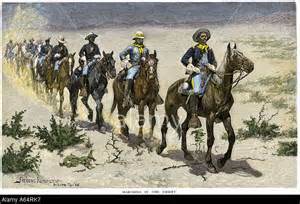 From 1866 onward, there were an average of 2,500 soldiers stationed in the Arizona Territory. At times, the numbers increased. During the 1886 campaign, 5,000 troops were on duty. After Geronimo surrendered in September 1886, the number of troops assigned to Ft. Lowell was gradually reduced. In February 1891, the fort was permanently closed. The army moved everything moveable, even the dead. Those buried at Ft. Lowell were taken to San Francisco and reinterred. In 1976, the old fort site was designated as a historic district by the board of supervisors. In 1978, it was placed on the National Register of Historic Places. 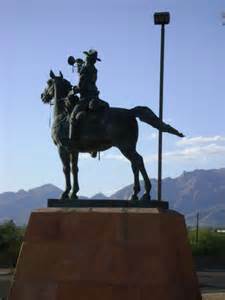 The Chief Trumpeter statue was erected in 1991 to honor the memory of the enlisted men who served in the Southwest during the Apache wars. It is a bronze horse-mounted cavalryman dressed in the uniform of 1884. Standing 14 feet high, it weighs 3,000 pounds. The Ft. Lowell museum reopens from its summer hiatus on September 10. It is expected to be open on Thursday, Friday and Saturday from 10 am to 4 pm.